With all Jane Kits products, the key to successful plating is in the preparation of the items to be plated. Parts must be chemically clean. In order to ensure that you get pleasing and consistent results. 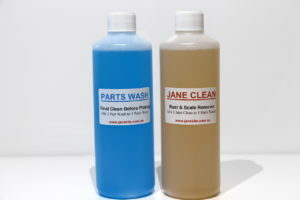 Jane Kits sell very efficient Cleaner Kits. Thorough cleaning is essential in the preparation of parts prior to electroplating. Jane Kits recommends and supplies two cleaners to ensure your items to be plated are prepared and chemically clean. 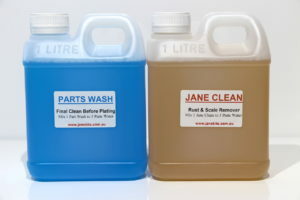 These are called Jane Clean and Parts Wash. If your items to be plated are new or are in good condition and are free of any traces of previous plating, then you may be able to avoid the need for Jane Clean, a quick wire wheel and then a final clean of Parts Wash may be sufficient. If the items are in poor condition, rusty or corroded, hang them in the Jane Clean and monitor them regularly. 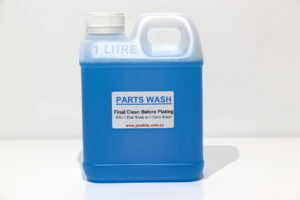 Take them out and rinse when they are free of rust or corrosion, wire wheel the parts and then move onto the final cleaning using the Parts Wash.
Jane Clean is a powerful rust and scale remover which will clean items showing signs of rust or other corrosion. 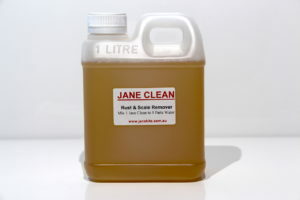 Jane Clean is also great for removing zinc plating, chromated zinc, cadmium, galvanising and other surface treatments. It is a multi-purpose acidic based solution that is an ideal tool for assisting in the preparation of items pre electroplating. It is predominantly used in the early aggressive stage of preparation to assist in bring your parts back to bare steel. 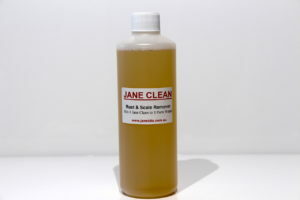 Jane Clean is extremely concentrated and the ideal mix for is 1 part Jane Clean to 5 parts water. Jane Clean can be used neat if required. As Jane Clean is used at the early stages of preparation and therefore your parts will then continue through other forms of cleaning and preparation prior to going into the plating bath, the original mix can be used multiple times. Make up a suitable mix of Jane Clean in a shallow container. Submerge the items into the container and monitor regularly. The time required in the Jane Clean solution will depend on the condition of the part to be cleaned. To assist in placing, removing and monitoring the items placed in the Jane Clean solution, wiring the parts with the copper hanging wire is recommended. This will avoid the need to place your hand in the solution. NOTE always wear chemical resistant gloves when working with Jane Clean. Any items left in a Jane Clean mixture should be monitored regularly. Jane Clean is ACID based and items left in this solution for extended periods of time will eventually damage the parent metal. 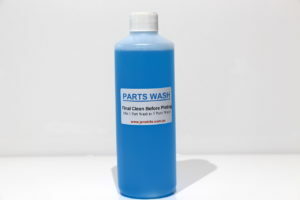 Parts Wash is a very strong cleaner which removes all traces of grease or film and is used immediately before your parts go into the plating bath. Using this cleaner ensures that the parts to be plated are spotlessly clean. It is recommended that this product is used as a final cleaning solution for everything that is to go in the plating or treatment baths (i.e. parts, anodes etc). This stage of preparation is critical, this is the final stage prior to parts going into the plating bath. During this step of cleaning, you must not touch the parts with your fingers. Make up a mix of Parts Wash and place it into a shallow container. Wire the parts up with the copper hanging wire ready to go into the plating bath and handle the parts holding the copper wire only. Do not touch the parts during this stage with your fingers, gloves, rags or place onto the bench. Don't make contact with anything other than the Parts Wash solution and the brush used to clean it. Once you have scrubbed the item in the Parts Wash bath, clean water rinse it twice, do a water break test and then place it straight into the plating or treatment bath. The best way to clean the items would be to brush them using a toothbrush for small items or a kitchen brush for larger items.